Contact our office to learn more about our interest-free Wells Fargo Health Advantage program. From regular cleanings and exams to advanced restorative treatments, all of your routine dental needs can be met right here. Norwell Family Dentistry is committed to providing excellent dental care for the entire family. Norwell Family Dentistry, is a full service dental facility in Norwell, Massachusetts. Our dental professionals are tops in their field, with full knowledge of the latest dental care techniques and technology. We are dedicated to improving your overall oral health and create beautiful, confident smiles to enhance your quality of life. Our warm, friendly and welcoming team focuses on making every patient feel comfortable. Most insurance programs accepted. Wells Fargo patient finance program, interest-free, is available. Call for details. We happily accept new patients. For new patients, please fill out the Forms available on this website and return to our office. Let us help you make your smile fantastic. After a fifteen year career in the airline business, Tina graduated in 2006 from Cape Cod Community College with a degree in Dental Hygiene. She has been practicing in our office since 2009. Tina finds the most rewarding part of her job is seeing the results in her patients, as their oral and overall health improves. She enjoys being part of a caring team that provides individualized treatment to each patient. In her spare time, Tina enjoys days at the beach, reading a good book and spending time with her husband and three children. Jackie is a graduate of Hingham High School in 1986, and graduated from the Forsyth School for Dental Hygienists in 1989. She has been helping creating, maintaining, & detailing many smiles for over 25 years! Karen joined our practice in October 2016. She worked as an Executive Assistant in Financial Services for over ten years and now she enjoys helping to keep our front desk running smoothly. Devon joined our practice in August 2017. Devon attended Lincoln Technical Institute and has been a Dental Assistant for over four years. She became a Dental Assistant because she wanted to help people and be in a busy and friendly environment. She loves getting to know the patients and helping them to achieve their best smiles. Dr Bob Liao received his BS in Biology from the University of Massachusetts, and his DMD from Boston University Goldman School of Dental Medicine. He has over five years of dental experience, and is a member of the American Dental Association, and the Massachusetts Dental Association. Dr. Liao is experienced in all phases of dentistry and is a welcome addition to our team. Dr. Moore graduated with a B.S. from Brandeis University and a D.M.D. from Tufts School of Dental Medicine. She completed her residency in 1999 at MSP Hahnemann University. 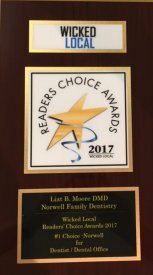 Dr. Moore has been recognized as a Leading Physician of the World and a Top Dentist in Norwell, MA by the International Association of Dentists. She is a member of the MA Dental Society, member of the American Dental Society, member of the Academy of General Dentistry, and a member of the American Association of Professional Women. Dr. Moore is committed to continuous education and strives to keep up on the latest trends in dentistry. Dr. Moore is a member of the Comprehensive Care Initiative Seattle Club, and a member of the Women's Study Club in Milton. "Visiting Norwell Family Dentistry gives my family and me more reasons to smile." "Dr. Moore provided me with excellent care when I needed it the most."